Your business is impacted within minutes of an IT outage. And finding the right person to handle an incident can take longer than actually resolving the issue! While you search for the right resolver, you could be suffering irreparable damage. 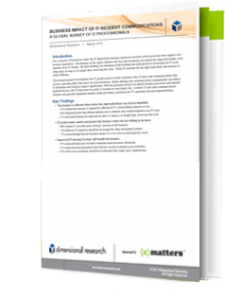 Grab The IT Incident Communications Report, based on a recent survey conducted by Dimensional Research, and learn how your IT peers actually respond to the IT alerts and communications they receive, and what effect they have on issue resolution.